ABOARD PARIS-HOUSTON FLIGHT, Oct 28 - When the rich get richer, the poor get poorer, and the middle class shrinks… what we have is a classic model of PLUTOCRACY. It’s a rule of the few over the many for the benefit of the few. Exploitation, injustice, loss of freedom, financial slavery, murder-suicides… are some of the consequences. Makes even socialism look more appealing by comparison. 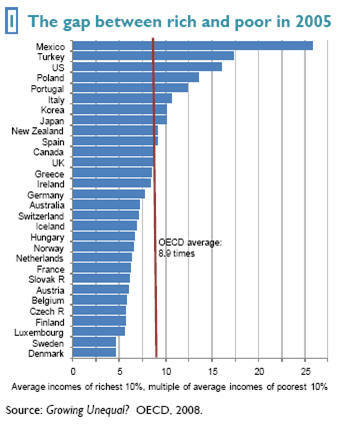 · The U.S. has the third greatest inequality in the OECD, after Mexico and Turkey -- and the gap has grown rapidly since 2000. 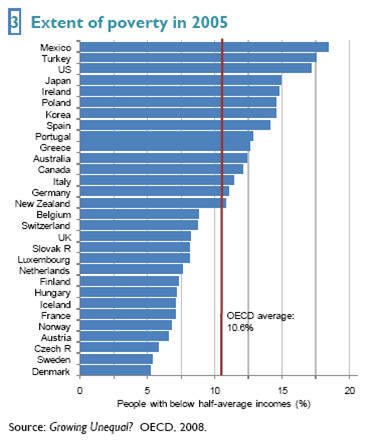 · The richest 10% of Americans earn an average of $93,000 (highest in the OECD). 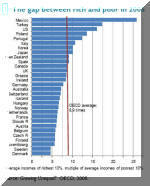 The poorest 10 percent of Americans earn an average of $5,800 (about 20 percent lower than the OECD average). · The rise in inequality is generally due to the rich improving their incomes relative both to low- and middle-income people. 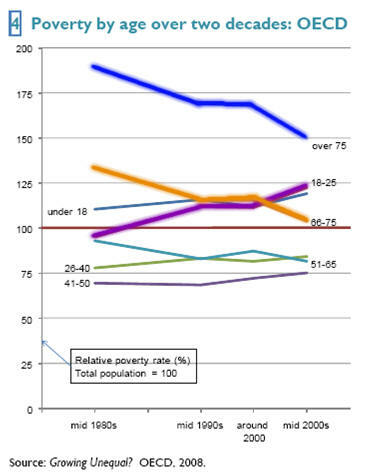 · Older people are much less likely to be poor than in the past. 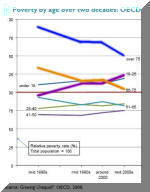 Poverty has shifted from pensioners to young adults and families with children (see chart below left). So sock to the young, seems to be the New World Order strategy. That’s the stuff revolutions are made of. But not today. Not here, in the U.S., or in most OECD countries. Leading the charge to the precipice are America's modern day lemmings - the Baby Boomers - the "white slaves" of the New World Order. They are spending themselves out of house and home, lured by the thrill of the (gambling) game, and suckered into a false sense of prosperity by the paper gains of their stock portfolios. (from “When Will Wall Street Bubble Burst?”, Aug 1998). (You can also check out some other warnings from 10-12 years ago in various other national and international media columns, like “Plutocrats of the New World Order,” Mar 1997; “Demo Farce and the American Century,” Nov 1996; “The Great Wall Street Hoover,” Nov 1997; “The Great American Divide,” Jan 1998; “Wiping Out the Middle Class,:” May 1998; “When Will Wall Street Bubble Burst?”, Aug 1998; etc.). The latest OECD study is actually UNDERSTATING the gulf that has developed between the rich and the poor. It is based on 2005 data, when everything looked rosy in the real estate market, for example. And it was in the last three years, especially in 2008, that the poor became even more impoverished as property foreclosures soared. Meanwhile, the rich have orchestrated bailouts of large banks with taxpayers’ money, including, of course, any taxes paid by the poor. So first the banks take their money, then the government finishes them off by collecting taxes with which to pay the bankers. No wonder the OECD report is likely to fuel public resentments on both sides of the Atlantic. Last week, Ulrike Mascher, president of Germany's largest social welfare advocacy organization, drove the point home when he said, "people ask themselves why 500 billion euros can be mobilized very quickly to recapitalize banks, while an effective poverty-fighting program is rejected due to budgetary concerns?" Because we live in a plutocracy run by bankers’ proxies. We don’t choose our political candidates. We merely vote for the candidates already picked for us by the New World Order leaders. In communism, people also voted… for the one candidate already picked for them by the Communist Party. Any similarities between the two systems are more than coincidental. It was the western bankers who financed Lenin and his Bolshevik revolution. Plutocracy is merely a two-party “demofarce” in which all candidates work for the same bosses – the global bankers. Together, they control and exploit the masses, claiming to be doing it for the benefit of the masses. So add a pinch of hypocrisy to the Bankers’ Borsht being cooked in the Big Brother’s kitchen. But there’s trouble brewing in the broth for the masses. While no Baby Boomer revolutions threaten the NWO plutocrats, their own excessive greed produced cracks in their financial armor. These cracks have now widened into fissures. And the fissures are jeopardizing not just the bankers’ assets, but also retirement incomes of hundreds of millions of Baby Boomers around the globe. The Financial Times reported on Monday (Oct 27) that the U.S. pension funds are facing the worst year of losses in history. The average state pension fund is down 15% for the first nine months of 2008. Some funds are down much more than that. California’s CALPERS, the largest U.S. pension fund, is down 20% this year. And that’s before the bloodletting that has taken place in October, the worst month for equities in decades. Again, no surprise there. I warned over 11 years ago about “the financial ‘tsunami’ which will crash on America's shores when this pyramid scheme collapses” (see “Bilking Main Street to Finance Wall Street”, May 1997). And “when will that be?” – I asked rhetorically in this Washington Times column. “When the "Baby Boomers" start to cash their pension checks en masse - at the latest. As long as payments to retirees come to exceed contributions by currently employed wage-earners, there will be a net flow of funds INTO the stock market, continuing to push it up." Well, are re aching that point now. 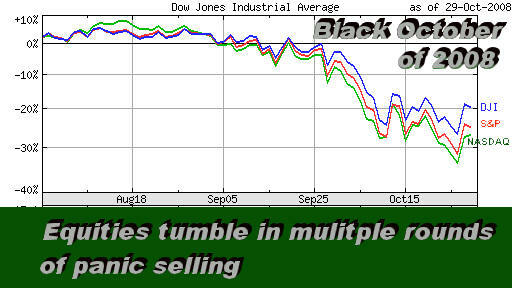 Just as inflow of money from the pension funds propped the stock market in the last decade and a half, the mad scramble by the fund managers to get out now is now adding to the panic and emotional selling (see “Black October” chart - left). We said over a decade ago that pension funds should never have been allowed to invest in equities. But the bankers’ greed prevailed, and the patsy politicians passed the legislation that opened the door for such high risk gamble with retirement security of hundreds of million people. Will that cause a revolution? Unlikely. Ever heard of revolutions by pensioners? No more likely than a Baby Boomer rebellion. Instead, stand by instead for suicide rates to go up. That’s the cowards’ way out. The murder-suicide case in a Los Angeles upscale suburb in early October, for example, may be just a precursor of tragic things to come. A former employee of a major accounting firm (Price Waterhouse), who had an MBA in finance but was having trouble finding a job, killed his wife and four children, and then committed suicide (see Six die in family murder-suicide in upscale LA home, AP, Oct 6; and LA man kills family, himself over financial woes, Reuters, Oct 6). Should the plutocrats ever be charged with crimes against humanity? Fairness demands that they should. For, driving honorable men and women to such desperation that they kill their loved ones and themselves is nothing short of a crime against humanity. At least in this writer’s book. “Desperate men do desperate things,” Shakespeare wrote five centuries ago. So isn’t a person who knowingly drives someone to desperation a co-conspirator in a crime that results? If such a standard of fairness and justice were applied, our prisons could be full of bankers, lawyers and politicians, and the streets free of crime. At least free of crime committed out of desperation. Such thoughts may be worth pondering on Nov 4, as you walk into the voting booth to mark your ballot in Election 2008. Perhaps time has come to elect candidates who stand for compassion and love, not money and power. Alas, I don’t know of any such politicians among either the Democrats or the Republicans. 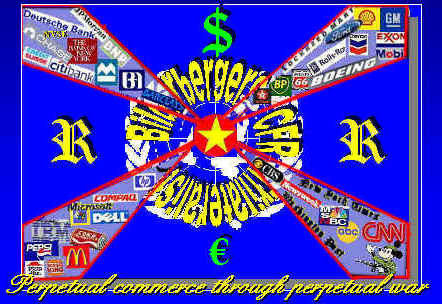 They are all bought and paid for lackeys of the New World Order bankers. The recent bailouts prove it. So, maybe we’d better vote for a write-in candidate, someone we know and respect in our community for his/her compassion and unselfish service to others. Maybe a fireman, a teacher, a policeman, a priest… He/she won’t get in, of course. But at least we’ll feel better for not contributing to the “demo farce” titled Election 2008. And maybe, just maybe, some day there will be enough people who will reach the point of declaring, “I am mad as hell and I won’t take it anymore,” as the Peter Finch character shouted in “Network” (1976). And then watch out, NWO Banksters and lapdog politicians. Bob Djurdjevic is a writer and consultant based in Scottsdale, Arizona. You can find more of his research and columns at www.truthinmedia.org (geopolitical) and www.djurdjevic.com (business). Also check out... “Plutocrats of the New World Order,” Mar 1997; “Demo Farce and the American Century,” Nov 1996; “The Great Wall Street Hoover,” Nov 1997; “The Great American Divide,” Jan 1998; “Wiping Out the Middle Class,:” May 1998; “When Will Wall Street Bubble Burst?”, Aug 1998; etc.